If you’re ready for the leaves to turn yellow and for smells of clove, cinnamon, and pumpkin bread to fill the air, help your home reflect your excitement for the changing seasons. These autumn-inspired decorating ideas are just what you need to make over your home this fall. Swap out throw pillows: Adding a little fall color to your living room is as easy as trading out your regular throw pillows for festive orange, red and yellow ones. Many styles and designs are available to ensure they still match your furniture. Set out a fall table centerpiece: Include all your favorite fall elements, from gourds and mini pumpkins to autumn leaves and Indian corn. These can be real or plastic. Light candles: The best mini fall home makeovers engage all the senses, not just sight. Candles are the perfect way to add ambiance, not only with the flickering orange glow but also with the relaxing autumn scent. Transform the mantelpiece: From classy white pumpkins to flashy golden candlesticks, you can turn the fireplace mantelpiece into a beautiful focal point that makes it clear – you’re excited fall has arrived! Hang garlands in the window: Visible from both inside and outside your home, window garlands add just the right touch. These can be formal and store-bought or lighthearted and handmade. Get the kids in on the project! Cut shiny scrapbook paper into leaf shapes and glue on small twigs to create veining. Hang the leaves on a thin piece of twine, and you’re done! 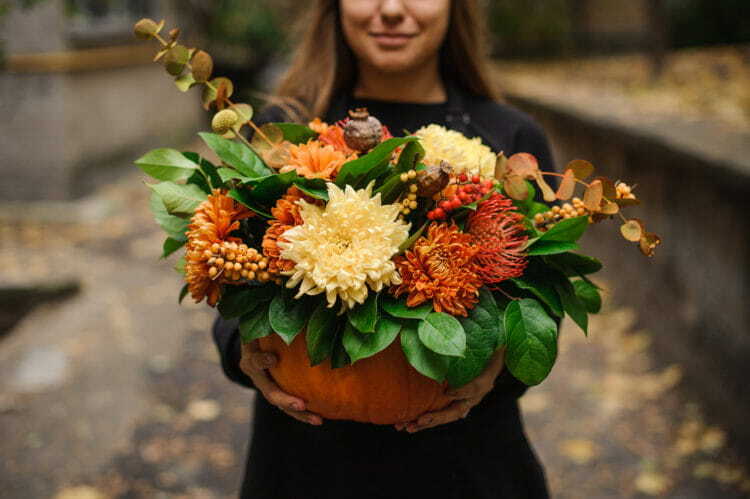 Set out fall floral arrangements: While buying faux marigolds and silk autumn leaves is certainly an option, you might also check your backyard for a free floral arrangement. Trim branches with changing leaves off the trees, pick up eye-catching twigs and grab a handful of autumn flowers. The tiny imperfections in these natural elements create a more authentic look. Hang a wreath on your front door: Welcome guests into your home and prepare them for the décor they’ll find inside by hanging a grapevine wreath on the front door. Dress up the wreath with whatever add-ins you want, including silk leaves, marigolds, orange and red beads, and miniature plastic gourds with stems. Decorate the porch: A festive welcome mat, bales of hay, fresh pumpkins and potted marigolds are the perfect way to say, “Welcome, fall!” The best part is, when Halloween arrives, you carve the pumpkins into scary faces perfect for the holiday. Bay Home & Window can help you transform your home even more. If you’re interested in adding plantation shutters, a new entertainment center, or other home décor and organization products, we have you covered. Over the past 20 years, we have completed over 100,000 installations to the delight of our customers. Contact us today to learn more about enhancing the elegance and sophistication of your Bay Area home this fall.